WILLEMSTAD - Graduation day at the Law Faculty of the University of Curaçao late June was even more festive for master student Andrea Geerlof. She won the 14th edition of the VanEps Kunneman VanDoorne Thesis Prize. Attorney Willemieke Princée did the honors and awarded Andrea with the prize, consisting of a check and a certificate as a permanent memento. The winning thesis was selected by a committee that was specifically appointed for this purpose. They reviewed the master theses submitted based on the criteria of legal quality, creativity, innovation and current interest. The university selected eight theses for the prize, all graded 8 or higher. Eventually, the special committee nominated four of them. Beside the one of Andrea, the theses of Naomi Cairo, Richeline Joe and Monique Bouman were nominated. 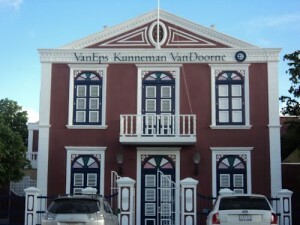 The winning thesis addresses the termination of the statutory share in Curaçao. The statutory share is a part of the assets of a deceased which can be claimed by heirs succeeding to the estate, often the children of the deceased, even if the deceased disinherited them in whole or in part in his last will.